As Guatemala seeks justice for historical violence, murders and repression continue against indigenous communities trying to stop environmental destruction. In Guatemala, the trial against former General Efraín Ríos Montt, who terrorized the country during his brief dictatorship in the early 1980s, continues. The general has been accused of killing hundreds of indigenous Guatemalans, and he is being tried on charges of genocide and crimes against humanity. Yet, even as the country seeks justice for some of those murdered during Guatemala’s decades-long genocide against the indigenous Mayans, repression and violence continues — particularly against indigenous communities that are trying to stop resource extraction and environmental degradation. For years, the Q’anjob’al community has been organizing in Santa Cruz Barillas, a region in western Guatemala, to defend its territory against a hydroelectric dam project. In spite of repression, harassment, detentions and a 17-day stretch of martial law imposed on the neighborhood, the community continues fighting to stop a Spanish transnational company from profiting off the region’s river. In recent months, the organizers have made significant gains, particularly in the campaign against political repression. On January 9, organizers who had been imprisoned for almost a year were released. Meanwhile, the community is building ties with Guatemala’s other anti-extractive movements, and under the slogan “We Are All Barillas,” the struggle has gained international attention. “Water is life! And this project only brings us death and violence,” says Micaela, a resident of Barilla’s neighborhood Cantón Recreo B. Michaela, who didn’t want to share her last name. She has been organizing since 2007 to stop the Spanish transnational company Ecoener Hidralia Energía from building a dam on the river that runs within feet of her home. The community’s main strategies to oppose the project have been organizing peaceful mobilizations and raising awareness through open dialogues. Through gatherings called consultations — community councils where every participant gets one vote — the widespread opposition to the dam has become obvious. At a public forum in Guatemala’s Congress at the end of February, the community demanded that Ecoener Hidralia Energía halt existing construction in the territory and that the government refuse to approve the construction of two additional dams, which are opposed by the surrounding communities. “Our demands are not only evident in the results of the community assemblies, which since 2007 have been asking that the hydroelectric company leave, but also in the streets, in all of the communities,” says Hermelinda Simón who participated in a peaceful protest on February 15 aimed at evicting the company from her land. Simón is aware that both the Guatemalan government and the Spanish corporation are attempting to divide the community on the issue of dam installation. As a result, she focuses on uniting people through informational sessions and leadership training. These workshops began in 2006, when organizers realized they needed to raise awareness about the impacts of megaprojects in the territory. The educational initiative soon spread, and organizers began going door to door in less informed neighborhoods. In response, the company started its own advertising campaign, claiming that the electrical output would benefit the communities. “[The company said] that it was going to plant trees, create jobs and generate income for the women who could wash the clothes of the men who worked,” said Simón. The company advertised most heavily in remote communities, placing ads on local radio and cable channels and even paying people to walk through the neighborhoods and spread misinformation. The communities still rejected the project. As the organizing in communities grew, the state began to persecute local leaders, imprisoning people on accusations of drug trafficking and terrorism. “In 2011, a string of legal persecutions took place against the leaders who had opposed the project,” explained Carlos Manuel Bezares, the lawyer representing the Barillas case. Last May, Simón was accused of drug trafficking, public disorder, coercion and terrorism. She isn’t the only indigenous community leader accused of these charges. According to Bezares, the government uses the specter of terrorism and drug trafficking to criminalize communities in resistance. By categorizing occupation of roads and mass mobilizations as “acts of terrorism,” the state is able to justify repression to the broader public. As during the era of Guatemala’s civil war, this repression is often violent. On October 4, 2012, the military killed eight people from the K’iche indigenous community during a peaceful protest against dams and mining exploitation in Totonicapan. Other people have been imprisoned, such as Guatemalan human rights activist Rubén Herrera who was arrested on March 15, 2012, and has been held on terrorism charges despite a growing international campaign for his freedom. Even simply refusing the company’s demands can be deadly. According to Simón, the company hired other people to buy up land without identifying the purchases as being linked to the dam construction. Pablo Antonio Pablo, 59, was one of the community members who received an offer for his land when the company first arrived in the late 2000s. He refused the offer, and on May 1, 2012, he and his friend were shot. Pablo survived, but his friend, Andrés Francisco Miguel, died. Many believe that the target of the assassination attempt was not Miguel, but Pablo, sparked by his refusal to sell his land, which lay close to the river and the dam construction site. 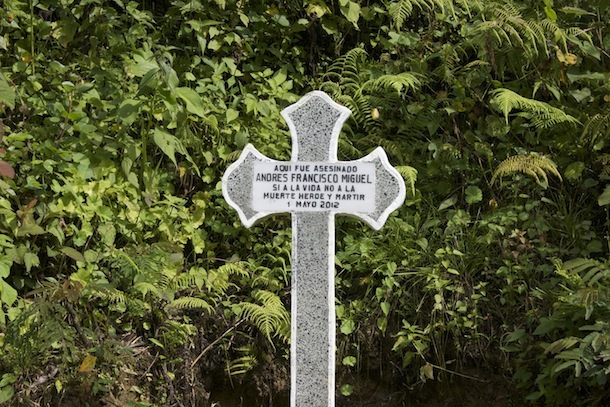 Nearly a year later, Pablo walked along the path where he was shot until he reached a stone cross placed in Miguel’s honor. There he explained the importance of continuing to organize despite intimidation. At a nearby community, neighbors echoed his words. “They already forced our grandparents and ancestors from their houses during the war. And now? Where do they want to send us?” said one indignant woman. She explained that the company’s security forces have been photographing everyone who passes company buildings in order to intimidate the neighborhood. Other regions in Guatemala that are organizing against resource extraction face similar threats of violence and repression. On March 17, one community organizer was murdered and three more were tortured in the indigenous Xinka community in Jalapa, a region in southeast Guatemala. The leaders were on the way back from a meeting where they were discussing organizing a community consultation to challenge mining in the nearby municipal of Mataquescuintla. “When those small communities organize, we suffer repression, even though we are peaceful,” said Pablo. “They want to make us afraid, just like those who are being judged today used to try to do,” said Rocael, a resident of Barillas. Rocael, who did not want to give his last name, was referring to the former general José Efraín Ríos Montt, who is currently on trial for genocide and crimes against humanity. Rocael’s story shows how violent repression is not only a part of Guatemala’s history; it is also a current reality. In May of 2012, when martial law was declared in Barillas following Miguel’s murder, Rocael fled to the mountains with his pregnant mother because they feared being detained by military forces. Other leaders fled with their families to the Mexico border. Rocael explains that for the first time in his life he understood the fear that his grandparents felt during Guatemala’s decades-long civil war, which raged from 1960 to 1996. During this period, the government carried out a genocide against the indigenous communities of Guatemala. There were 669 massacres, with more than 200,000 people killed and more than 45,000 disappeared, according to data from a report titled “Guatemala: Memory of Silence,” issued by Guatemala’s Historical Clarification Commission. According to the United Nations, 6,000 murders took place each year, 98 percent of which remain unpunished. Today, indigenous communities like the Q’anjob’al in Santa Cruz Barillas are facing a resurgence of civil war-era repression and violence as a result of organizing to defend territory. “Ever since the company arrived, we have had violence,” said Micaela. The martial law ended last May, but Barillas is still heavily militarized and covered with police barracks. According to Bezares, other regions where extractive industry projects are being pushed have been militarized as well. “Mining or hydroelectric dams, the model is the same,” he said. This militarization also comes at a unique time for the Guatemalan armed forces, which is experiencing an influx of retired military professionals who claimed to be experts in intelligence and counter-insurgency. These men were also key actors in the civil war and genocide. Rocael is only 21 years old, yet talks as if he were an old man. He doesn’t speak Spanish, but he explained in Q’anjob’al that the regions where the violent conflict occurred decades ago are the same areas where new extractive projects are now being imposed. Before they were forgotten places; now, they are considered profitable opportunities. In Barillas, terror and fear are still palpable with the continued military and police presence. It revives the community’s memories of persecution, assassinations and deaths that took place during the 36-year conflict. But just as intense community organizing finally succeeded in bringing at least one genocidal leader to trial, indigenous peoples are now organizing against displacement and death caused by extractive industries. The question is whether they will win victory today, or retributive justice decades from now. Translation from the original Spanish by Lela Kiran.